This one gets trotted out around March of every election year. And around March of election year, I stop reading, or even casually glancing, at the Nation and every other pseudo-liberal magazine whose writers stuff their critical perspectives deep into the back of their closets—you know—the perspectives that they used to criticize the incumbent for the prior three years—in order to jump on the “lesser of two evils” bandwagon. And the chorus goes something like this: “Who would you rather have? The Democratic candidate who’s pro-choice (see VM #2) or the Republican candidate who’s anti-abortion?” This refrain is usually followed up by, “He (the Democrat) is the lesser of two evils,” after all. Here’s the translation on the chorus: “Who would you rather have? The good looking, charming, suave, well-dressed, ivy-leaguer with New England reserve and Northern accent? Or the ignorant fratboy with the menacing smile, crude manners, and vacuous personality who so reminds me of the bad guy in any James Bond movie that I’d rather jump off a bridge to my death than be forced to shake hands with him (again, see VM #2)?” And just in case y’all think I’m picking on Obama, go back and reread the Nation in 1992 (Bill Clinton v. George Bush I), 1996 (Bill Clinton v. Bob Dole), 2000 (Al Gore v. George Bush II), and 2004 (John Kerry v. George Bush II). And here’s the translation on the “lesser of two evils” refrain: Sure, there isn’t much distinguishing them: they’re both neo-liberals on economic policy; they both want to cut Social Security and Medicare; they’re both pro-war, pro-imperialist expansion, pro-warrantless surveillance, pro-rendition, pro-indefinite detention. But still, we have to vote for the Democrat, because there are some IMPORTANT differences, after all: The Dem is pro-choice (see VM #2), he’s pro-environment (see VM #2); and the Democrat wants healthcare reform. At bottom, the refrain really means: “Hey, Bill/Al/John/ is one of us (see VM #1). He talks like us; he went to school where we went/wanted to go (even though the Georges did also); he seems like someone I’d be friends with, and after all, I’d vote for my friend if he was running, so….” Huh? This is what counts as “the lesser of two evils”? Evil is evil. Period. It can’t be quantified, unless you’re a Benthamite utilitarian and you’re ok with selling out black and brown folks overseas for some more time to rest nice and comfy in your own house. Black and brown folks—especially poor black and brown folks– at home have not been sold out; they’ve just never been allowed to buy in. The reproductive rights of black women have been taken away time and time again—through forced sterilization, through the absence of access to reproductive service and medication, and through the absence of access to affordable healthcare—and no, Mitt Romney’s Massachusetts’ mandatory purchase-healthcare (which was the model for national healthcare) does NOT solve that problem. What about the civil rights of black men, you ask? Wait, I’m don’t understand. What are those? Are those the ones that the Democrats signed away in the 1996 “3-strikes You’re out” bill, which managed to find a way to put away an even larger swath of black men and other men of color. As of 2002, over 2 million were imprisoned–remember, this is before the War on Terror was well underway. What about the civil liberties of brown and Muslim men? Umm, have you not been paying attention? So to folks who buy into this model: please don’t pretend that you are voting for someone who will enable better possibilities for someone other than you–certainly not for migrants and U.S. indigent, poor, or working-class folks of color. You may be voting for someone who will maintain the status quo for yourself and others in your socio-economic class. That’s fine. But imperious self-righteousness is hardly a good argument. And don’t worry, you’re being sold out, too. A vote for a “lesser” evil is still a vote for evil. 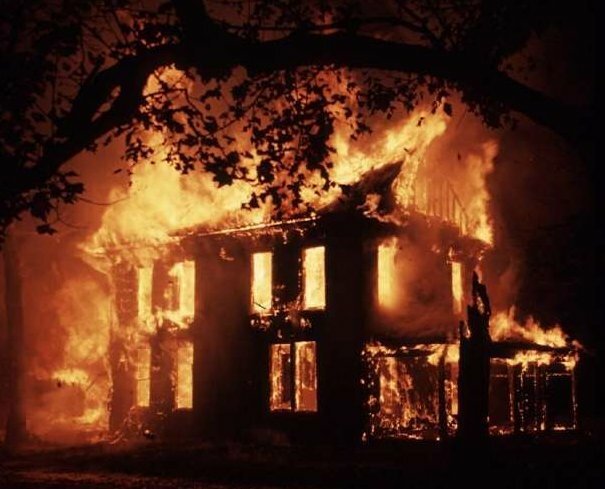 And the 12th hour urge/guilt-trip/admonishment to vote for the Democrat is a bit like hurling a bucket of water at a house that’s going down in flames because you surrounded the fireplace with parched Christmas trees and then started a blazing fire. Yes, it’s an emergency, and supposedly some water may be better than none, and yes, I understand that we’re supposed to band together to put out the fire. But we let the damn fire happen in the first place. That election fire can’t be put out by a few buckets of water (aka, a last-minute capitulation to the “lesser of two evils” guilt-trip). 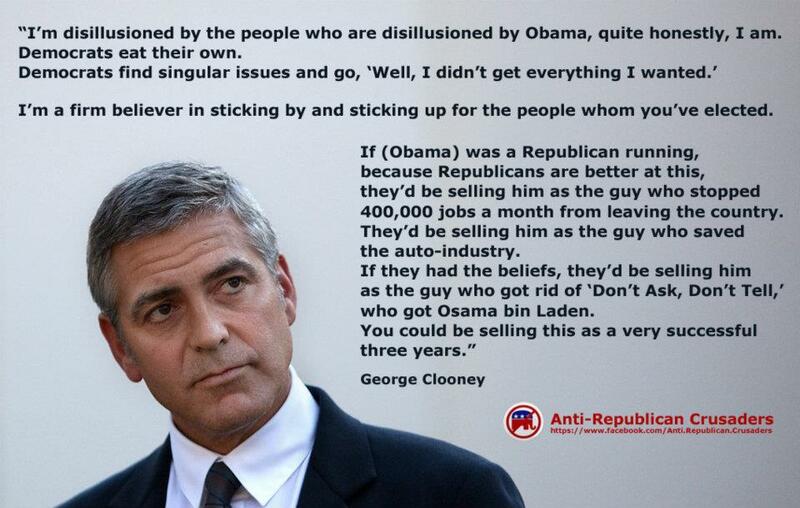 Hand in hand with this argument, is the loyalty supposedly articulated by George Clooney, which has been righteously circulating around Facebook: “I’m a firm believer in sticking by and sticking up for the people whom you’ve elected.” (Is it too coy to point out that this quote comes from a man who just dumped his umpteenth lover?) Unconditional loyalty is for sports teams, your family/friends, and your pets. Ah…if only the Democrats could heed the loyalty argument for their constituencies. Stick by us and we’ll stick by you. Anything else is nothing short of an abusive relationship: you kick your voters in the teeth and then insist you love us and that we can’t throw you out. So, what to do? I’ll respond more in a future post, but in the meantime, let me just say this: the national elections don’t matter at this point. We need to work on local races, local elections, alternative institutions. And why do we need to accept the “two-party option” that grounds the “lesser of two evils” vote? In the short term, we have no options. But we need to retain a historical memory, and build with a view to the long-term future. Abusive relationships need to be abandoned. see NAFTA (1993), Glass-Steagall Act (1999), Riegle-Neal Interstate Banking Act (1994), Colombia, South Korea, Panama Free Trade Agreements (introduced by George II during his time in office, but remained unpassed. These free-trade agreements were passed recently in October 2011), the Commodity Futures Modernization Act (2000), among others. This article is spot on ! A false choice between two candidates who have been already selected by entrenched power, the monied elites, and its mouth piece corporate run media- or as Orwell would say the “Ministry of Truth.” 2012 will be a lose/lose for the electorate once again while the status quo is rebuilt brick-by-brick, and the mass of the poplation pays the price once again by suffering under the weight of austerity, less constitutional protections, and cannablism by the well-to-do. Ah, finally some good old-fashioned disagreement. Hi, Max, good to see you here, and thanks for the welcome. Unsurprisingly, I disagree with you on most of your points: I think lesser-of-two-evils phrase used to defend one’s voting is a way to rationalize the decision to concede to hegemonic power and the so-called “options” with which we are presented (and I’m not discussing lesser-of-two-evils acting in other areas of life; there, the phrase makes no sense, since life is hardly Manichean). Swing-state voting: Vote for whomever; it will make little or no difference in terms of the improvement of current US state policies or practices. And if Obama, who was elected in light of the extreme anger at Bush, and by an enormous mandate in 2008, refused to exploit a Democratic majority in the House and Senate to try to push back on Wall Street, Civil Liberties, Guantanamo, the PATRIOT Act, I hardly believe that he will acknowledge any popular pressure, let alone be partially responsive. His press spokesman was pretty clear about what he/they thought of the Left’s anger last year: we’re not folks to be taken seriously; we’re kooks. http://thehill.com/homenews/administration/113431-white-house-unloads-on-professional-left. In light of the last 3 years (though, I think we saw what he was about well before November 2008), I doubt that he’s going to acknowledge, much less respond to the pressure of Occupy or any other uprisings to in what is essentially a lame-duck term. The issue is not about “lesser-evil-ism.” We always carry out (or should try to carry out) what we think is the lesser-evil, nowhere more so than under capitalist liberal democracy. The question is the concrete one of what is the lesser evil, and that is the question of who we should vote for given the generational uprising now before us. For me in a swing state, that’s Obama — not for the usual reasons trotted out that small differences in a system of immense power can translate to large outcomes, but because Obama will be under popular pressure to actually live up the false hope he represents. If the Republicans win, that hope will be channeled into an Obama re-election campaign or a search for a new savior. If Obama wins, he has to be partially responsive to popular pressure. Of course as you get to at the end, voting should not take up more than a moment of our thinking or our lives, on that we agree totally.